Fahrrad T400 bike with steel frame (weldable, as opposed to aluminium), 26 inches wheels with Schwalbe tires, and Shimano Deore 24 gears. – Tubus carriers, back and front. Able to carry up to 40 kg. – Ergotec adjustable hornbar, so that we can change position of hands and rest sollicitated muscles during the day. Most of those rock solid products are made in a good, old fashioned german way. The whole bike worths around 1300 euros. I’ve been training fully loaded and it feels great riding it…incredibly efficient now that it’s in perfect shape! Would a trailer, instead of the panniers, work better for a tour like the one you’re doing?… or, would both panniers and trailer work well for a longer haul? 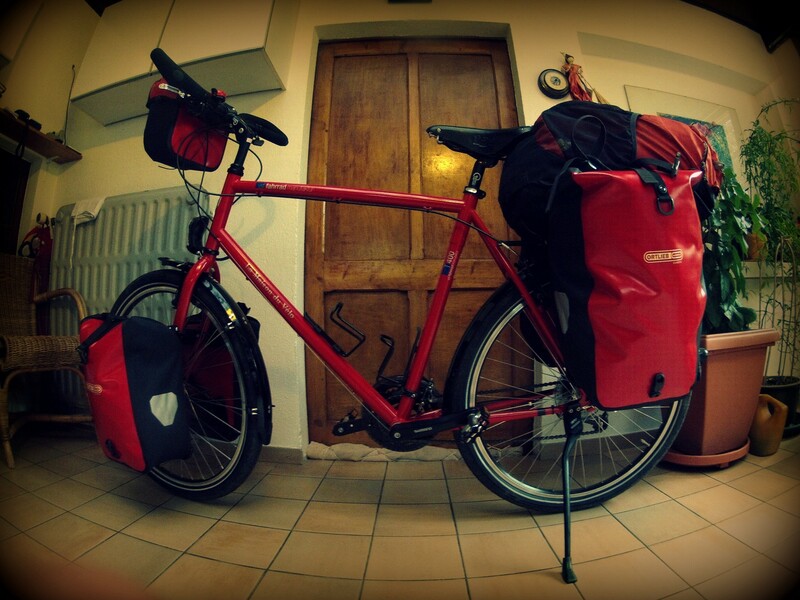 I’m asking because I do wish to know more about ways to pack for a bike tour I’m dreaming of.